October of 2017 Update: I needed to update this post to add 1 extra step because Google added an additional piece of verification to this process. Most likely because of me showing tens of thousands of people how to delete all of their junk mail. Warning! 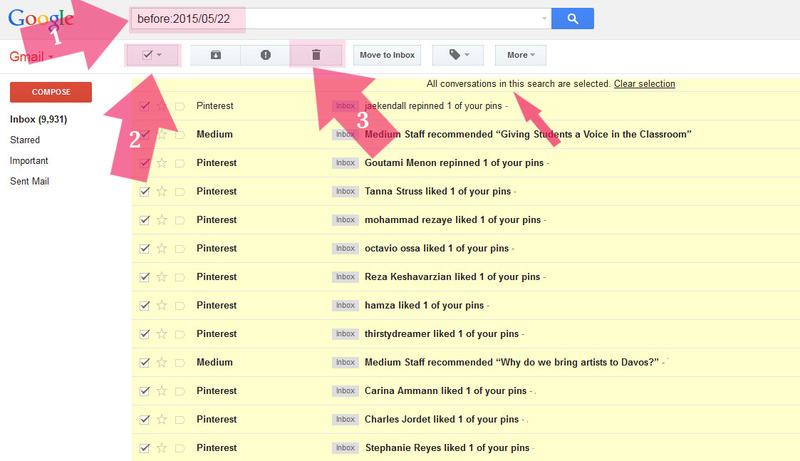 You are probably about to delete a huge amount of email, please be aware of what you are doing. Always backup your email before attempting to delete your email or any data for that matter. If you scroll past this page you acknowledge that you will not hold me liable for any damages that may be incurred by deleting email. Thanks! 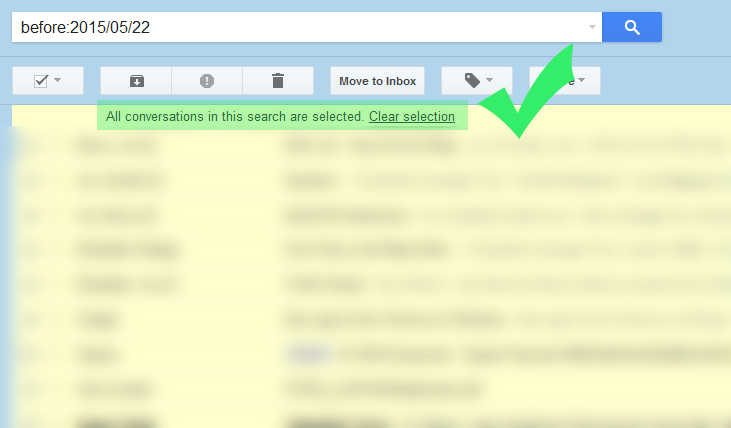 This method is mainly for when you have a HUGE amount of emails and don’t feel like deleting them a hundred at a time. I’ll start with this illustration, and then talk a bit about it. Meaning – delete everything before May 22, 2015. This basically means all 10,000 emails are selected, not just the default 50 or 100 emails that you see on your screen. 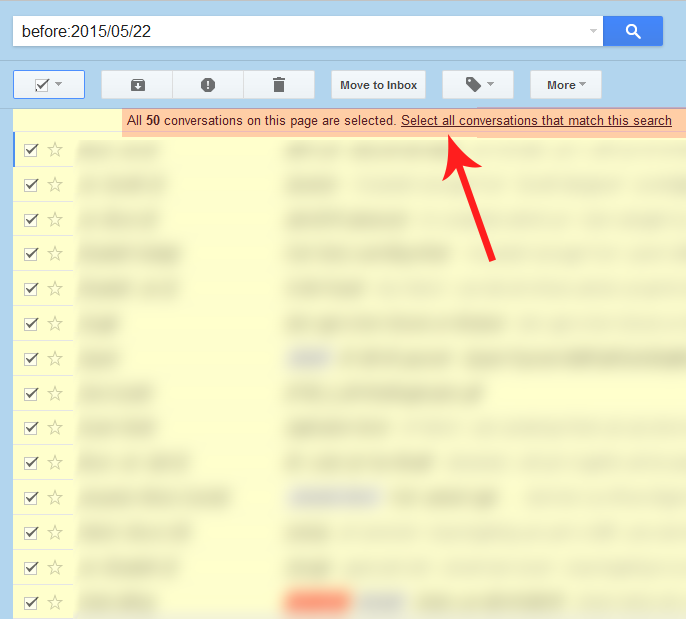 Step 2.5 Updated – In addition to checking the magic box, you now also need to click the link that says “All conversations that match this search.” Google added this extra step sometime in 2016 to make people think twice before selecting huge amounts of email to delete / move / archive / mark as spam etc. Step 3: Click the trash button. You will probably get a warning which you will need to affirm. Once that happens it might take a minute or two. I just deleted almost 10,000 emails and it took about 2 minutes. You might get a “still working” message while you wait. You can use this method to do a bunch of other stuff such as archive your email, mark it all read, mark it unread, or delete it. Please note that if you are using this method with a connected email + domain, this may or may not delete the email off your server depending on your mail server setup. You’ve been warned, but let me warn you again. Think before you hit that delete button, because you ain’t gettin’ those emails back.